A workshop covers an understanding of the tools, equipment and their purpose at the Works, and the experience of printing using a press appropriate to your interest. You may have recently taken an interest in letterpress printing and wish to learn about the technique and equipment involved, and to 'try your hand' at printing. You may have some knowledge of letterpress and now wish to put your ideas into print. ​You may have a one-time project - like an invitation -you'd like to see printed letterpress. You may have an interest in graphic art and wish to add experience with letterpress to your portfolio. Your workshop and the equipment to be used would be tailored to meet your interest. The workshop covers the tools, equipment and the process of basic letterpress. Step-by-step instruction enables you to set your own text and layout, and set up and print on a press appropriate to your work. The programme also allows for experience on four presses. ​All materials are provided but you are invited to supply your own printing stock. Workshops are arranged on days and hours to suit you. An introductory workshop takes a full day, and can be extended. A workshop is limited to two persons. The fee for a full day's workshop is $60 which includes entry to the Museum. It's suggested that you discuss what you would like to print when nominating a date. You will learn from Tony King, a letterpress printer specialising in table-top and full size treadle platen presses, and also the production of photo-polymer plates for hobby printers. A former President of the Association of Handcraft Printers NZ, Tony is 'owner' of the Groups.io site ( Letterpress Down Under) which is open to anyone interested in letterpress discussion. You can join at Groups.io/p/letterpressdu . 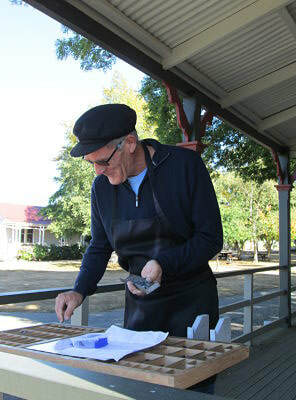 Tony has been active with letterpress as a pastime for more than 50 years and has conducted workshops in several centres in N.Z.